Professor Shad Wenzlaff, at Edgewood College, recently asked his Art History class to site works of art that they considered beautiful and others they could consider Sublime. Prof. Wenzlaff offered quotes by Gavin Hamilton as well as Edmund Burke to help formulate the perceived difference. I found this question intriguing and offer up my opinion of work that fall into these separate categories. To put a framework around the following quotes, here is a brief note about art in the mid1700’s. At this time, Europe entered an era of Enlightenment. People began to base their thinking upon reason and order. New discoveries in science were being made and shifts in philosophy were giving ‘mankind’ great confidence through intellect. (‘Man’ being gender neutral!) This new thinking gave way to a revival in classical art from ancient Rome and Greece. Within this new context, art theorists began to discuss beauty in art. On the other hand, work that could be considered Sublime, can be beautiful, but carries with it an emotional charge, often dark, thought provoking and sometimes uncomfortable. Categories: Art Criticism, Art History | Tags: Allegory with Venus and Cupid by Bronzino, Art as Beauty, Art as Sublime, art in 1700's, Birth of Venus by Botticelli, Blue Dancers by Degas, classical art revival, David by Michelangelo, Doryphoros by Polykeitos, Edmund Burke, Era of Enlightenment in art, Garden of Earthly Delights by Bosch, Gavin Hamilton, Les Demoiselles D’avignon by Picasso, Olympia by Manet, The Little Girl in White by Whistler | Permalink. There are endless writings and discussions based on the question of : ”what is art?” This question is fun to grapple with because there is no universal, correct answer. Must it be beautiful? Must it have moral purpose? Each of us as artists contributes to ‘art’ in our unique way, and as viewers, take from it what resonates with our individual souls. Art fills different needs for different people, and the definition of ‘good art’ has changed depending on the cultural context it was created in. As we look back through the history of art, we see art serve many purposes from pure, ideal beauty to the ancient Greeks, to spreading religious dogma through the commissions by the Roman Catholic church in the Middle Ages. As time passed and art patronage moved from the church, to the aristocracy to individuals, to gallery representation, artists themselves changed their role in art. 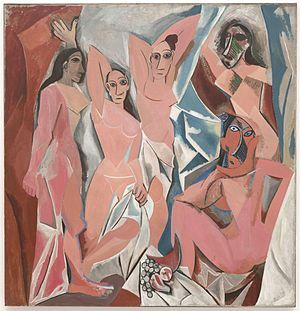 They moved from being ‘skilled’ craftsman serving a patron to individuals with power to direct and express themselves through their art – hence the gradual emergence of the age of Modern Art and new concepts of beauty. We as a culture are just far enough outside the bubble of Modern art to begin to see it objectively (as juxtaposed with Post Modernism). I am currently reading the book, Has Modernism Failed?, by Suzi Gablik. Gablik has raised some good (and controversial) points about Modern Art: its loss of tradition, its disassociation from spirituality and disconnection from the general public. In my opinion, she sees the work of this era as a movement of self-indulgence for inner world of the artist. Gablik expresses that modern art has become little more than a commodity in Western society. She emphasizes that art must serve a social need to have value. Gablik calls on art to speak of social responsibility, morals and stress anti-consumerism. She suggests that what modernism really needs is a return to “soul.” She argues for “reintroducing the artist in his role as shaman – a mystical, priestly, and political figure”. Gablik also gives me the impression that the artist needs to reflect or acknowledge the traditional rules of ‘classical’ art once again – reel in the concept of ‘anything goes’. “Rebellion and freedom are not enough,” she states, “Modernism has moved us too far in the direction of radical subjectivity and a destructive relativism. At this point we might do well to make the most of a few well-observed rules again”. What she is missing in her critique, I believe, is the simple recognition of art’s aesthetic value and its power to transform the spirit through beauty and form. Art can serve as a mode of change both as ‘social activism’ art and through privately touching the soul of the individual through simple beauty. Categories: Art Criticism | Tags: beauty in art, Has Modernism Failed? Suzi Gablik, modern art, Motherwell, Pollick, Rookmaaker | Permalink.